This help article is specifically about the emails your attendees and bookers will receive. For information about account admin notifications, please see here. A link to review the booking (including options to cancel and transfer, if you have these allowed in your settings). 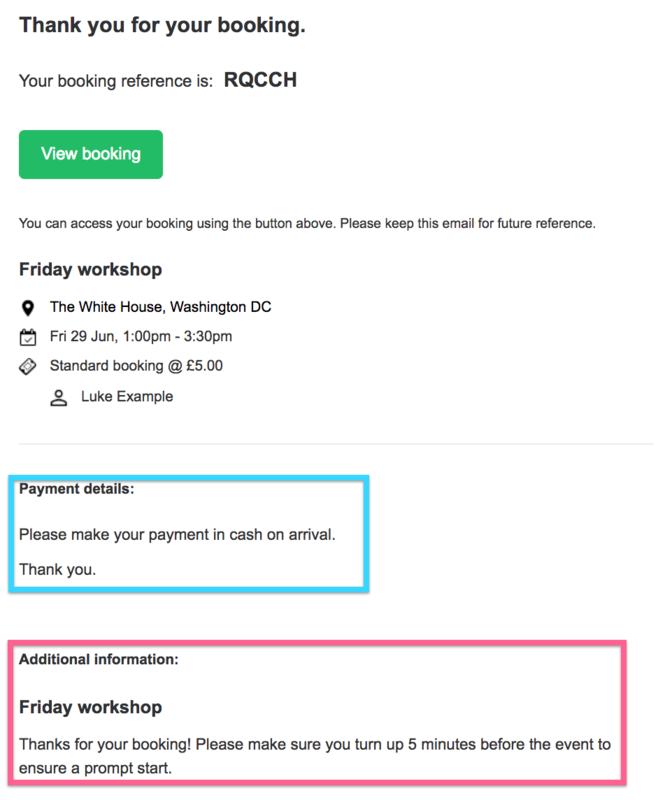 Any post-booking information (highlighted in pink below) you've added to the email. This can be edited under the Information tab when you click Edit entry on any entry in your schedule. It's a good place to add links to attachments too (for course materials, for example), which you can host on Bookwhen. Offline payment details (highlighted in blue below). If you've allowed the option of offline payments then a customer will see the offline payment instruction text in the email. An .ics calendar file for the event. This makes it easy for the attendee to add the event to their calendar software to stay organised. You can set when your reminder emails go out to customers here. 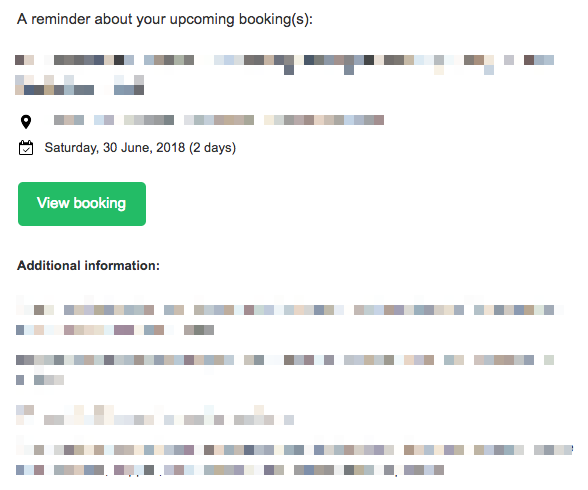 Any post-booking information (see below screenshot under 'Additional information') you've added to the email. This can be edited under the 'Information' tab when you click Edit entry on any entry in your schedule. It's a good place to add links to attachments too (for course materials, for example), which you can host on Bookwhen. When an admin or booker cancels or transfers a ticket, they're receive a notification via email. The email contains a link to the booking on Bookwhen as well as basic information about the event. You can learn more about how the waiting list works in our help article here.